Mike Figga came back from early career difficulties, then a season-ending knee injury years later, The New York Post wrote. Then he made the majors in two brief stints in 1997 and 1998 and appeared in line for more playing time in 1999. As for what changed to get him going, Figga's manager at AAA Stump Merrill explained. "A little bit of success and the opportunity to play," Merrill told The Post that March. "He has good tools. He needed to improve his receiving and he has. He has come a long way." Figga went on to play in 43 major league games that year, mostly after a move to the Orioles. Those 43 games, played in his 10th professional season, proved the bulk of his major league career. 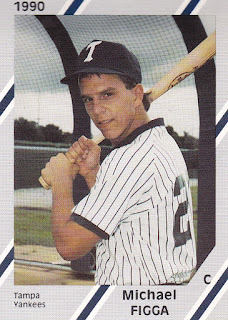 Figga's career began in 1989, taken by the Yankees in the 44th round of the draft out of Florida Community College. He was also credited as Michael Figga. Figga started with the Yankees in 1990 in the rookie Gulf Coast League. The catcher hit .285 in 40 games. He moved to high-A Prince William for 1991, then Fort Lauderdale in 1992. He hit .177 over 80 games at Fort Lauderdale. Figga played 1993 largely on loan to high-A San Bernardino and his fortunes revived. He hit 25 home runs there, along with a .264 average. He hit his 20th home run of 1993 in an August game. "That one felt special right there," Figga told The San Bernardino County Sun after his 20th. "I hope I can keep up the pace. It's kinda weird. I expected home runs, but not 20." He played 1994 at high-A Tampa, then 1995 largely at AA Norwich. He started 1996 at AAA Columbus, but a knee injury ended his season. Figga returned for 1997 and he made his major league debut that September. He got into two games and went 0 for 4. He then returned to the Bronx for one game in 1998, where he went 1 for 4. After two defensive appearances early in 1999 with the Yankees, the Orioles claimed Figga of waivers. He then got into 41 games with Baltimore. He hit .221. At the start of his stretch with Baltimore, Figga told The Baltimore Sun he embraced the uncertainties. "Whether I'm here for a month or the rest of the year, I'm going to take it in stride and enjoy it. I'm in the big leagues," Figga told The Sun. Figga returned to the minors for 2000 and he stayed there through 2002, while playing games for five organizations, in independent ball and in Mexico. He last played in 2004 for the independent Nashua Pride.